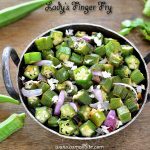 Okra / lady’s finger in English, Bhindi in Hindi, Vendakkai in Tamil, Bendekayi in Kannada is such a versatile veggie. 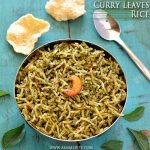 There are so many recipes that can be prepared with this veggie, that too each and every dish tastes good on its own. I have shared 2 simple tricks to get rid of the sliminess in the veggie, read the recipe till the end to know the tips. 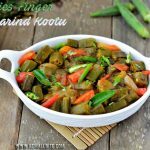 This vendakkai poriyal recipe / ladys finger fry recipe goes well with sambar, rasam, dal tadka and can be had with chapathi as a side dish. 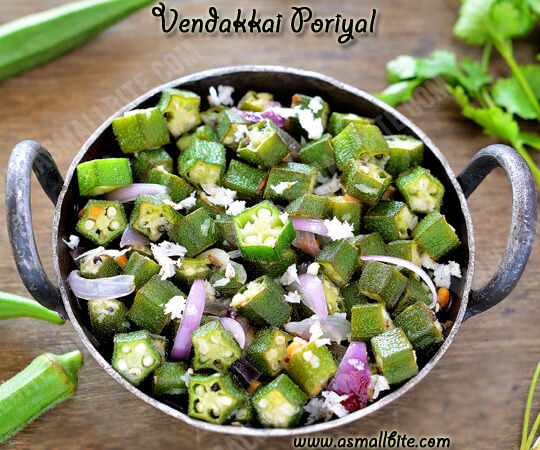 I have already shared okra sambar and butter milk gravy with okra, which also tastes delicious, if interested do check it …..
Slice the onions finely and slit green chilli. Then rinse the okra well and pat dry it without any moisture (this step helps to get rid of sliminess). 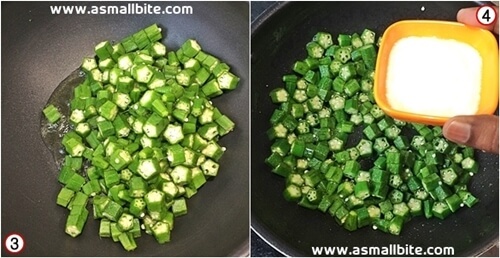 Discard the head and tail part, then chop the okra into medium or thin slices. Then measure and keep all the ingredients by side. Heat oil in a non-stick or heavy bottomed pan, then add the chopped okra. Pour the curd and saute in high flame for 2 minutes, till the curd evaporates. Also don't change the colour and make it mushy. The sliminess would have gone by this time and keep the sauted okra aside. In another pan, heat oil and temper with the ingredients given in the table 'To Temper'. Now add onions, green chilli and saute till the onions turn translucent. Then add the sauted okra and sprinkle little water. Add required salt, turmeric powder and mix well. Cook for 2 to 3 minutes in low flame, till it softens. Finally add grated coconut and give a quick stir. Switch off flame and garnish with coriander leaves. 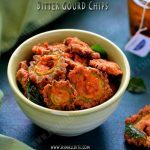 Serve this vendakkai poriyal recipe with paruppu urundai kulambu. 1. Slice the onions finely and slit green chilli. Then rinse the okra well and pat dry it without any moisture (this step helps to get rid of sliminess). 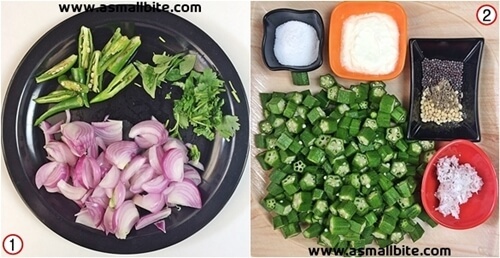 Discard the head and tail part, then chop the okra into medium or thin slices. Then measure and keep all the ingredients by side. 2. 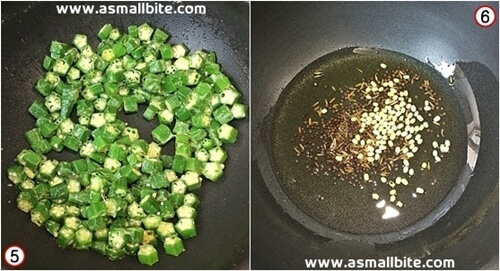 Heat oil in a non-stick or heavy bottomed pan, then add the chopped okra. Pour the curd and saute in high flame for 2 minutes, till the curd evaporates. 3. Also don’t change the colour and make it mushy. The sliminess would have gone by this time and keep the sauted okra aside. In another pan, heat oil and temper with the ingredients given in the table ‘To Temper‘. 4. Now add onions, green chilli and saute till the onions turn translucent. Then add the sauted okra and sprinkle little water. 5. 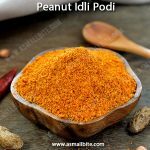 Add required salt, turmeric powder and mix well. Cook for 2 to 3 minutes in low flame, till it softens. 6. Finally add grated coconut and give a quick stir. Switch off flame and garnish with coriander leaves. 1. Choose tender okra for more taste. If you bend the tail, it should break easily, then the okra is tender. 2. Pat dry the veggie before chopping, as it helps to get rid of the sliminess. 3. 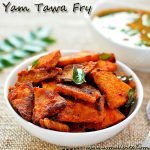 You can even skip onions and prepare it as no onion version. 4. Green chilli can be replaced with 2 tsp of red chilli powder. 5. 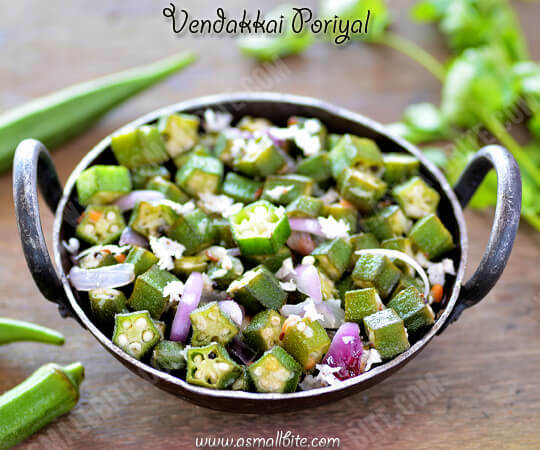 Adjust green chilli as per spiciness preferred for this vendakkai poriyal recipe. 6. 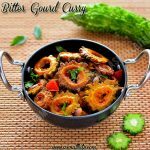 Curd helps to get rid of sliminess easily. But don’t use sour curd, else the veggie smells bad. 7. When sauting the veggie with curd (step – 3) , do it in high flame only. 8. Use a heavy bottomed or non-stick pan to avoid burning at the bottom. 9. Also don’t pour water when cooking the okra (just sprinkle only), otherwise it would become mushy. 10. 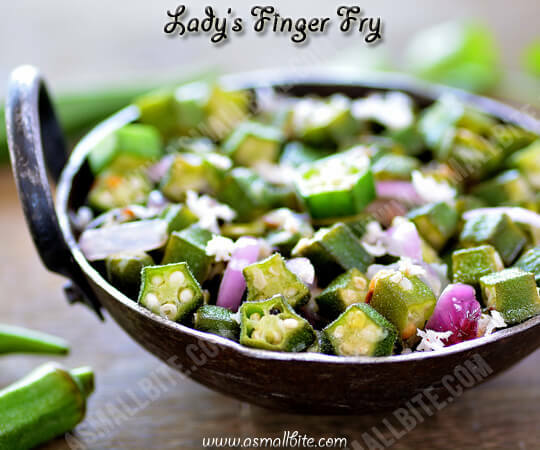 For more taste, 1 tsp of sambar powder can be added for this ladys finger fry recipe.